Netflix’s US price increase is a test to subscriber loyalty as even minor price variations could have “significant implications”, according to The Diffusion Group (TDG). Anticipating that Netflix would up its prices in 2019, the US-based research group conducted a survey among US broadband users in December 2018 to test price sensitivity should Netflix raise the cost of its service by either US$1, US$3 or US$5 per-month. 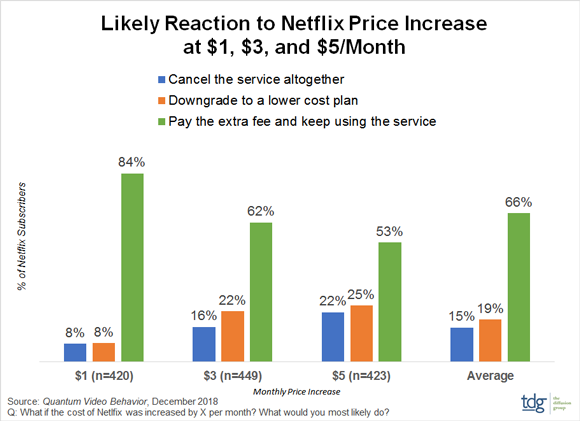 The ‘Quantum Viewing Behavior’ survey found that with a US$1 increase, 8% of Netflix subscribers would downgrade their plan, while 8% said they would cancel service altogether. At US$3 per-month more, the rate of likely cancellations doubled to 16%, while the rate of likely downgrades nearly tripled to 22%. Meanwhile, a US$5 per-month rate increase prompted 22% of respondents to say they would cancel and 25% to downgrade their Netflix service. The publication of TDG’s survey results come in the same week that Netflix announced it is raising its US subscription prices by 13% to 18%, its biggest increase since the company launched its streaming service in 2007. The price for Netflix’s cheapest plan is going up from US$7.99 to US$8.99 per month; it’s most popular price plan, which offers access to high-definition programming for two different internet-connected devices at once, will see the largest price jump going from US$10.99 to US$13.99 per month; while the cost of its premium plan will increase from US$13.99 to US$15.99. “While TDG believes that Netflix will endure any short-term backlash from these increases, it is undoubtedly reaching a level of price resistance across all tiers,” said Michael Greeson, President of TDG. TDG’s annual Quantum Video Behavior study addresses video habits across a wide range of services. The latest research surveyed 1,940 US adult broadband users.